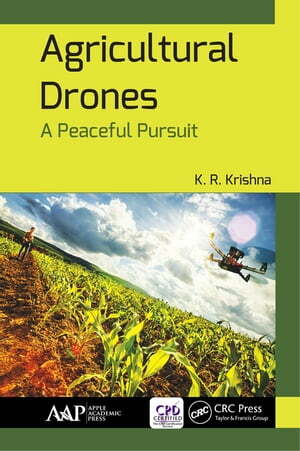 Collins Booksellers - Agricultural Drones by K. R. Krishna, 9781351764308. Buy this book online. Agricultural drones are expected to revolutionize the way we conduct agronomic procedures and maintain natural vegetation on earth. This book explores the increasing importance of the role of aerial robots in managing agricultural farms and natural resources. Agricultural Drones: A Peaceful Pursuit provides a wealth of information on drone usage in agriculture. The book discusses the advanced sensors and imaging capabilities of drones that give farmers new ways to increase yields and reduce crop damage. An introductory chapter provides historical data, with details about various models of drones as well as the most recent and popular agricultural drones in usage. The book goes onto look at such topics as the use of drones for soil fertility, production agronomy, irrigation, weed control, pest and disease control, grain yield forecasting, and economic advantages from drone use. This timely and useful volume will be a valuable resource for faculty, agricultural extension officers, and farmers and farm consultancy agencies. This book would also serve as an excellent textbook for students in agriculture, engineering, geography, etc.